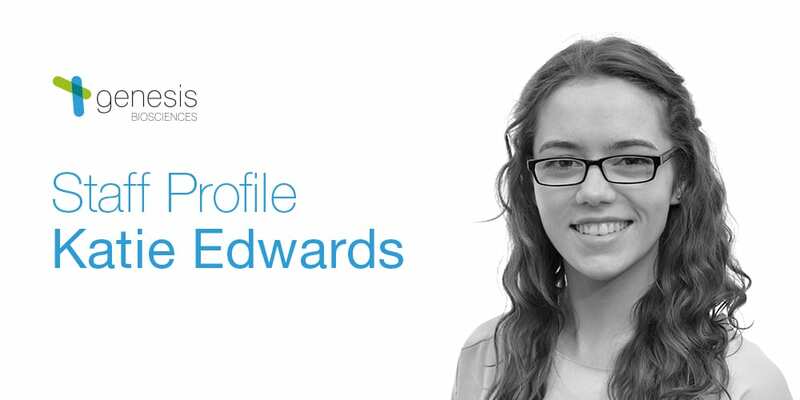 As a Research and Development Scientist at Genesis Biosciences, Katie is responsible for developing our product line extensions and carrying out research into the application specific capabilities of our Bacillus strains in our UK lab. Before joining us as a Research and Development Scientist, Katie began with a degree in Biochemistry from Warwick University in England where she undertook the interdisciplinary course that explored the biochemical and structural basis of molecular, cellular and developmental processes in a variety of organisms. This course equipped her with practical laboratory and research skills across topics like microbiology, organic and physical chemistry, genetics and statistics – knowledge she uses every day here at Genesis Biosciences. The scientific methods we employ to develop our products wouldn’t exist without scientists like Katie, working hard to ensure we’re at the top of our game across several industries. Some people probably wouldn’t know what your role as Research and Development Scientist involves – how would you explain it? The company has two main areas that I carry out research and product development for: the microbial products and the antimicrobial range, which often confuses people as they seem to be completely opposite! I usually say that I carry out testing for our antimicrobial range and develop line extensions to kill off ‘bad bacteria’ using natural essential oils for their antimicrobial properties. Then the microbial products are cleaning products which contain ‘good bacteria’ that work on breaking down dirt, grease, soiling and bad smells rather than using harsh chemicals. You studied Biochemistry at Warwick University. How did that help to prepare you for working every day in Genesis’ laboratories? My degree had a lot of laboratory and practical modules and at least one full day a week was spent in a laboratory. At first this teaches you simple skills, such as following a protocol and basic lab safety, but by third year you’re confident in conducting experiments, analyzing the results and writing up clear and concise reports explaining your methods and conclusions. For me it was the environmental aspect, my interest in science started at a young age watching things like the ‘Really Wild Show’ and David Attenborough documentaries. I’ve been interested in biodiversity, conservation and environmental issues ever since. 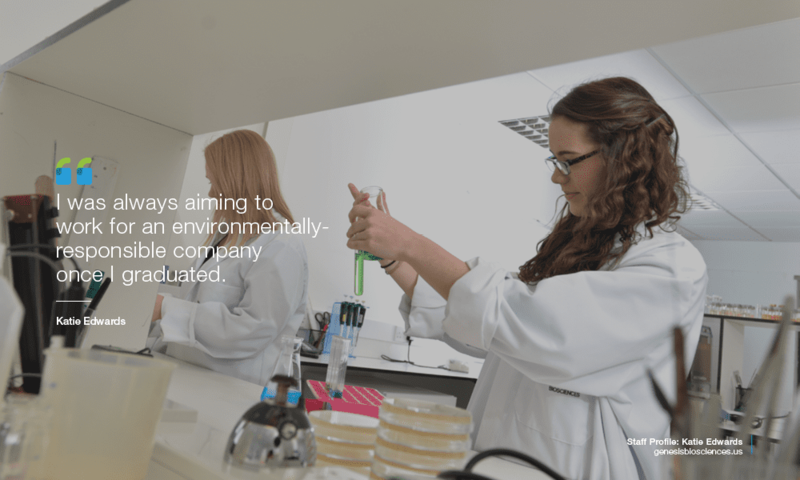 This led me to choose science at A-levels, then science at University and I was always aiming to work for an environmentally-responsible company once I graduated. What’s one thing that drives you in your work as a Research and Development Scientist? I don’t think there is one specific thing, there are lots of things that drive me. I’ve already mentioned the environmental aspects that I really care about. Working alongside such a knowledgeable team where everyone works hard and for each other is a big motivation, and I’m always learning from my co-workers. I also love that I get to work on so many different projects as part of my job, no two days are the same. I am involved in the development of new products from start to finish. This is great as in some companies Research Scientists would only be involved with one small stage of development, then it would be passed on to a whole other team. What does your typical work day as a Research and Development Scientist include? I don’t think I have such a thing as a typical day! My job is so varied, which I love. 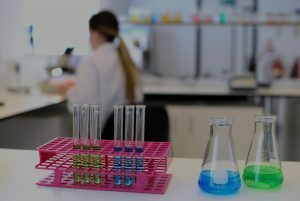 As well as setting up tests or analyzing results for the development of new and existing products for both the microbial and antimicrobial sides of the company, my responsibilities include ensuring all the COSHH (Control of Substances Hazardous to Health) for any chemicals we have in the lab are up to date. I’ve recently started being involved in our internal audit process to ensure that we continue to hold our ISO 9001 and 14001 accreditation. Some days I’ll offer technical support to customers, whether that’s doing work in the lab or responding to questions they may have. Changing the perception held by most people that all bacteria are bad and that harsh chemicals (e.g. bleach) are needed to clean properly. 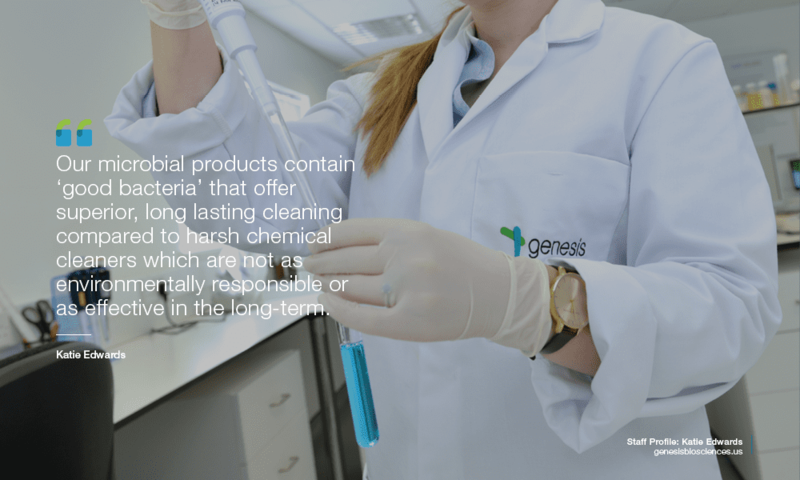 Our microbial products contain ‘good bacteria’ that offer superior, long lasting cleaning compared to harsh chemical cleaners which are not as environmentally responsible or as effective in the long-term as microbial cleaners are. Also our antimicrobial products contain essential oils, identical to those found in nature, which are capable of not only preventing malodor, but can control infection risk through anti-microbial action, which is part of my job to validate. What is one thing the general public might not know about your job as a Research and Development Scientist? I think a lot of people struggle to get their head around the fact that I research and develop both microbial AND anti-microbial products, to most people outside of the industry or without a scientific background, those two things don’t obviously go together. What would you say is your greatest achievement at Genesis so far? Being involved in the development of an antimicrobial product, specifically for overnight use in the water tanks of floor cleaning machines. I started being involved in conducting the lab work for the project towards the end of 2015 and after countless hours of testing the product was launched at the Pulire show in May last year, which gave me a huge sense of pride. Who knows, anything! As I’ve already said, my job is so varied that I already get to work in different aspects of the company. I’d like to continue my development of skills and company knowledge to be more customer facing, or take a more supervisory/managerial role of R&D projects, but at the same time I love working in the lab so don’t want to miss out on being hands on with research projects! To find out more about the work of Debbie and Genesis Biosciences, visit our About page.